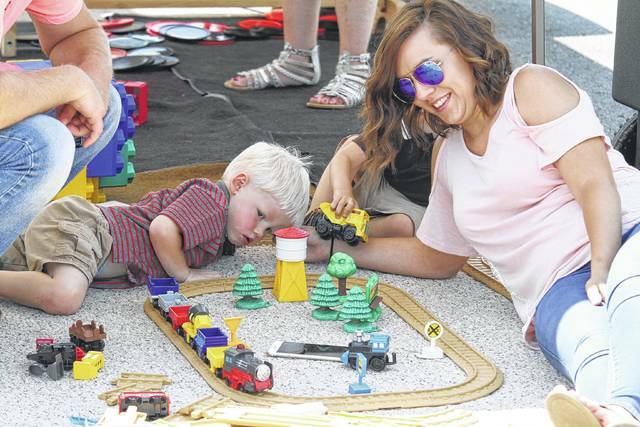 Colin Knippen, 2, of Ottoville, takes a break from the festival activities and sun to find shade and play with trains with family friend Jessica Wurst on Sunday afternoon. See more photos from the Immaculate Conception Church Festival in Ottoville. OTTOVILLE — Tina Weber, one of the Immaculate Conception Catholic Church festival chairwomen, can’t remember how long the parish festival has occurred, but it’s been a long time. This is the major fundraiser for the church. This year’s festival took place Saturday and Sunday. “We are doing wonderful. So far everything is ahead of schedule. It’s been lots of fun,” Weber said. Saturday’s activities were more of a social event. “It was for people to come and relax,” Weber said. Sunday’s event was successful with crowds filling the parking lot of the church. Children enjoyed the two inflatables, games, tractor pull and train rides. “For the tractor pull, we had three age groups, and the middle age group pulled 200 pounds,” Weber said. There was entertainment for the children, as there was a program, Indiana Wild Live Animal Show. “They brought bunnies, snakes, bugs, skunks, etc. The kids so enjoyed it. The message was God made all of the animals. The kids could touch all of the animals too. It was so much fun,” Weber said. With Ottoville being a small community, everyone pitches in. The Ottoville mother’s club bought a train set at a thrift store and set it up in the middle of the parking lot on a big rug. “It has been amazing. The kids have been playing with it all day long,” Weber said. The usual festival food was there, too. Cotton candy, snow cones, a baked goods booth and more. The festival had a record number of items, 97, donated for the raffle booth. A Golf Ball From Heaven Drop occurred at 6 p.m. Sunday. This was the second year for the unusual event. There were 300 golf balls numbered from 1 to 300. Tickets were purchased with the corresponding number as the golf balls. These golf balls were loaded into a plastic container, and the container was then turned upside down dropping from 50 feet in the air. Window Creations, of Ottoville, used its company lift to dump the box of golf balls. Last year five golf balls ended up in the hole, and the $500 prize was split five ways. All 300 tickets were sold, so all 300 balls were dumped. Two balls ended up in the hole this year. Dustin Wannemacher and Kathy Heitmeyer, both of Ottoville will split the $500 prize. The festival is a homecoming of sorts. “It’s nice to see the community come together and support the parish,” said Kim Hilvers, of Ottoville. She had three girls, ages 11, 8 and 5, at the festival. Jen Walston, of Ottoville, has come to the festival every year. The money raised from the festival will be used for operating costs, religious education, upkeep of the church and parish center. “It’s been a perfect day,” Weber said. Reach Merri Hanjora at 567-242-0511.